Summary: Thirteen year-old Heck finds himself on his own as his mother takes one of her breaks from reality. Caught up in the desire to be his mother’s hero while keeping the true nature of the situation a secret so he won’t end up in another foster home, Heck ends up getting locked out of his apartment and living in a car. When people who know him try to help, Heck shuts them out, believing that if he can only find and perform the one, greatest Good Deed, he’ll even out the cosmic score and his mother will come back to him. Along the way he meets Marion, a young man with issues of his own, and Heck thinks if he can help Marion see himself as he truly is it will be the ultimate Good Deed Heck has been looking for. Review: With a mother who has trouble with the pressures of life, Heck has learned to ease her discomfort by picking up the slack at home. 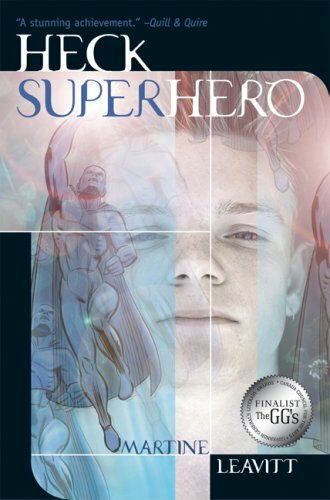 His mother considers Heck to be her hero, and when things go wrong in Heck’s life it shows itself in his art as he starts drawing only superheroes, expressing his inner desire to save her. When she disappears and the landlord forecloses on their apartment, Heck slips into his superhero persona, convinced if he just finds the right Good Deed, she’ll come back. Heck reminds me of Adam from The Unlikely Hero of Room 13B by Teresa Toten because they are both sons trying to save their mothers, Heck through being a superhero hero and Adam through his OCD behaviours and being inspired by superheroes. They’re both genuine, likeable characters who obviously care a lot about family. I was simply absorbed by Heck’s response to his situation. Pretending to be a superhero is about powerlessness he feels over his circumstances, but I loved how he grew to realise it was also something his mother was putting on him. She wanted to be rescued; she was the one who kept calling him her hero. When Heck steps back from things and realises he doesn’t want to be the hero anymore, he just wants to be a kid, it’s a powerful moment. Especially when he is able to tell his mom how he feels. It seems like a small detail, but I loved the bit about Mr. Bandras’ sandwiches. His wife always makes sandwiches he claims he doesn’t like so he can give them to Heck. It’s obviously a ruse, but it’s such an endearing one that shows how much Mr. (and Mrs.) Bandras care about Heck. Mr. Bandras is a teacher that goes above and beyond. Martine Leavitt’s Heck Superhero hooked me into Heck’s unique perspective, and I found myself wondering if he too was dealing with mental illness, or if his desire to reunite his family was just so great it fostered his delusions. Either way, I hope his mother is able to pull things together and live with Heck again. “It was true that everything he knew about art he’d learned from Mr. Bandras. Especially the one thing. After a few classes with Mr. Bandras, Heck had been trying to copy something exactly, drawing it just right. People always admired him for the way he could draw things exactly. Mr. Bandras, however, had come up behind him and grabbed the pencil out of his hand. “A new painting had been put in the window. It was of a young girl happily cutting out paper dolls from a newspaper, but as she cut, the paper bled. The dolls writhed in agony. Heck stared. Even his teeth weren’t louder than that. He’d always known paintings could make things happen. This painting made you want to punch something or go home and sit in the car while it ran for a long time in an enclosed space. You had to be good to do a painting like that. You had to be willing to follow your nightmares around and take tweezers to the waste products of your brain. But what if you could make a painting that made you want to share your oatmeal and bring flowers to your gramma’s grave? Instead of painting what was ugly in the world, what if you painted what was beautiful? Wouldn’t that be like a Good Deed? What if you showed the world something beautiful where no one had seen beautiful before? Like Marion – everyone treated him like mutant maladaptive, but they didn’t see that light in his eyes, didn’t see how good he was at playing. What if a painting could be ultimate Good Deed? What if it could change the world? Or even the entire microverse of one person? 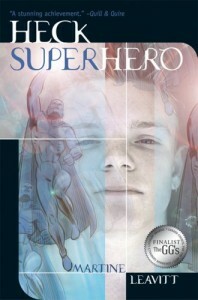 Heck Superhero by Martine Leavitt is published by Red Deer Press, (2004).